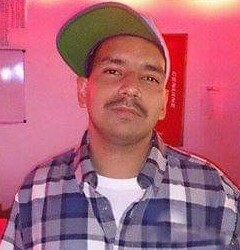 John-Eric Richard Borrego, age 33, passed away January 31, 2019 in Corpus Christi, Texas. John-Eric was born on January 26, 1986 in Corpus Christi, Texas. He was creative artist and poet with excellent cooking skills. He is preceded in death by his grandparents, Johnny Borrego, Mary L. Diaz, great grandparents, Gilbert Chapa and Antonia Chapa. He is survived by his 2 daughters, Victoria Borrego, Savannah Borrego; his mother, Jo Anna Cevallos; his father, John E. Borrego; 3 sisters, Breanna Nicole Borrego, Emily K. Borrego, Nevaeh M. Borrego; grandparents, Linda Borrego; and his niece, Angellee Borrego. Visitation will be held from 5:00 p.m. to 9:00 p.m. on Friday, February 8, 2019; with a Funeral Service to be held at 7:00 p.m. that same evening.